All Items listed below are available for sale in the store. If you would like to purchase a piece, stop in, or we can ship it to you, give us a call at 360-352-3864 for a personalized shipping quote. Rare 1964 Beatles coloring book (not colored in) vendor 7. Beautiful hand painted Italian 4 PC decanter set. This would be a stunning addition to your holiday decor. Rooftop mid-century California pottery dishes. Sweet 1950's Lefton Miss Priss kitty cookie jar. Wonderful vintage white Silvertone Radio. 8 piece vintage Culver whimsical cat and owl glasses. Vintage Jami navy and white hat with red stitching on the brim. Fun early 1900's 3 piece kitchen canister set. Dealer 19b. Pair of unique antique wood juggling pins. Fine example of rare late 1800's cloisonne vase on a wood stand. Fabulous 3 piece vanity set which includes a standing adjustable tilt mirror, hand mirror and brush. Each piece has a special patina reflecting its age. The standing mirror is 14 inches tall and would look beautiful on a dressing table or bathroom vanity. Can be seen in vendor 5a's space. Beautiful Lithuanian amber necklace made of fossilized resin from prehistoric trees that was pressed by the Baltic sea for millions of years. This and many other incredible pieces can be found in the front of our shop. Wonderful hand carved Ainu Japanese Hokkaido bear. It's measurements are 9 1/2 x 6 inches. It can be seen in vendor 58's space. Amazing native American cast iron bookends. .Each one is 4 1/2 x 5 1/2 inches and are in very good condition . They would be a beautiful way to show off your favorite books. They can be seen in vendor 55's space. 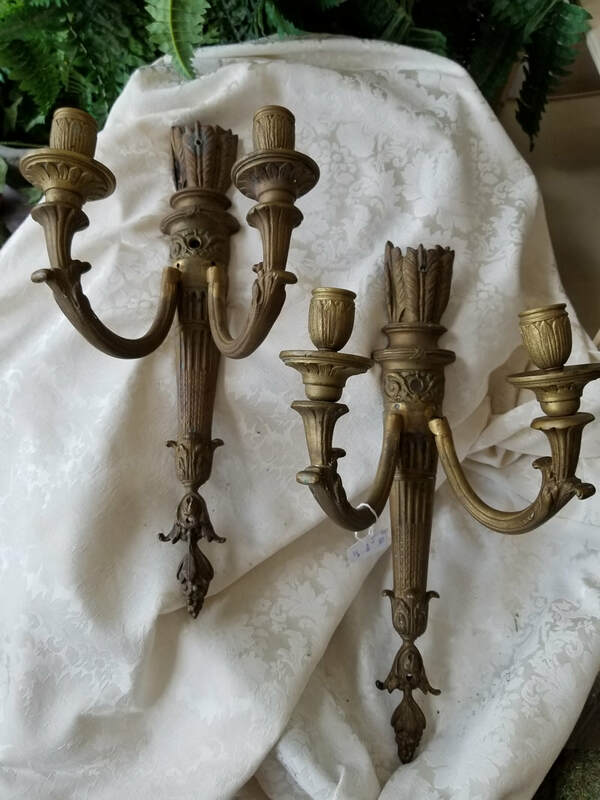 Pair of beautiful bronze candle sconces. Each one is 17 inches tall and would look great in a French inspired room. They can be seen in vendor 60's space.